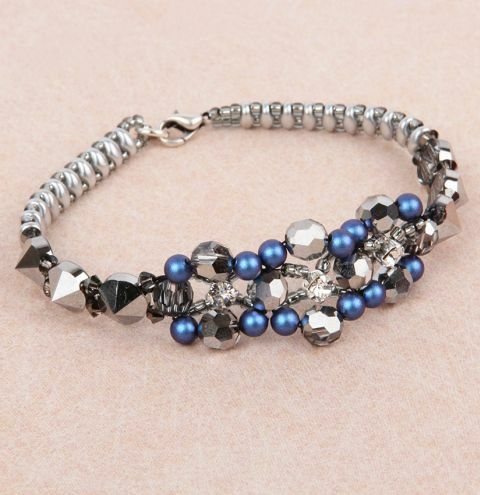 Learn how to make this delicate bracelet with Swarovski Iridescent pearls and sparkling spike beads. 1. Thread the needles onto 1 metre of thread. 2. Thread on the clasp and place it exactly in the middle of the thread. 3. Thread three 11TRs on each thread and slide them so that they are on both sides of the clasp. a) Then pass the right thread through 1x SD and 1x 11TR. Repeat 8 times. b) Drag the left thread through the free hole in the first SD, thread 1x 11TR and drag the thread through the free hole in the next SD. Repeat 8 times. c) To complete this step, pass both threads through 1x SD. 4. Using the right needle, thread 1x 3mm AC, 1x Spike AC and repeat this step twice. 5. Using left needle, thread 1x 3mm AC, pass the needle through the free hole in Spike AC, repeat twice. 6. Thread 1 x 3mm AC for each thread. 7. Drag the right thread through Faceted AC, then drag the left thread starting from the side from which the right thread comes out. 8. For each thread, pass 1 x HH, 1 x Faceted AC, 1 x HH, then go through Faceted AC as in the previous step. Repeat twice. 9. Repeat steps 4, 5 and 6. 10. Repeat step 3a, 3b, 3c. 11. Put on the right thread 3 x 11TR, soldered ring, 3 x 11TR. Then pass the thread through almost all the beads strung to the left thread. The last bead you need to thread is 3mm AC. 12. Pass the left thread through all the beads on the right thread, starting from 11TR and ending with 3mm AC. 13. Pass the right thread through Faceted AC (your needle is now on the left side of the beadwork). 14. Thread 3 x 11TR, 1x AC177, 3 x 11TR. Pass the thread through Faceted AC. Repeat twice. 15. Pass the left thread through Faceted AC (your thread is on the right side of the beadwork). Repeat step 15. 16. Use the rest of the threads to secure your work. Simply weave through the other beads in your bracelet, then make a knot and cut the rest of the threads off. If your bracelet is too small, simply add a few split rings to extend the chain. You can also use ready-made extenders.